Director/Photography – Oren Peli, Screenplay – Christopher Denham & Oren Peli, Producer – Jason Blum, Visual Effects Supervisor – Andre Bustanoby, Visual Effects – Beau Studio, Goat VFX (Supervisor – Jake Morrison) & Nitrous Visual Effects (Supervisor – Geoff Leavitt), Special Effects Supervisor – Pamela Elliott, David Therrien & Bob Williams, Special Effects – Special FX Unlimited, Makeup Effects – Masters FX & Scarlet Aqua, Inc, Hybrid Aliens – Almost Human Inc (Supervisor – Robert Hall), Production Design – Patrick Sullivan. Production Company – Blumhouse/Solana Films/Room 101/IM Global. Three friends, Reid, Darrin and Ben, travel to Las Vegas, filming everything with video cameras. Reid has become obsessed after experiencing a UFO encounter three months earlier and they have conceived a plan to break in to Area 51. Reid obtains plans to the key S4 area from Jelena, a girl whose father supposedly worked there. They follow a man they know to be an Area 51 employee, sneak into his house and steal his swipe card and fingerprints. Using hi-tech jamming equipment, pills and freon suits to avoid motion, heat and ammonia detection, they break in through the fence. Successfully making it into the main complex, they head down to S4 to discover what is hidden there. 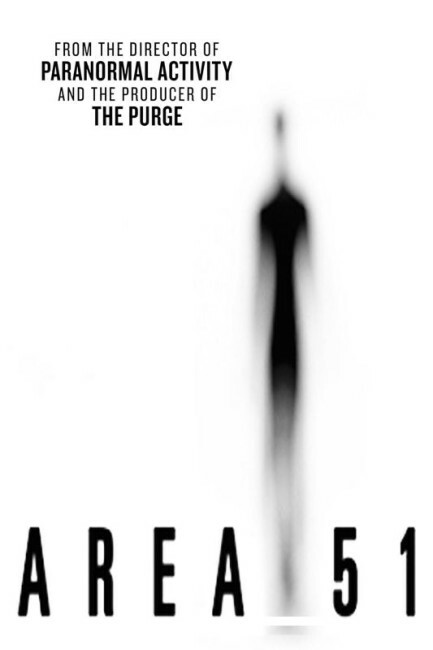 Area 51 is the long-awaited second film from Oren Peli. Eight years earlier, Peli created a sensation with Paranormal Activity (2007), which started a franchise and, in particular, majorly ignited the Found Footage genre on film. Peli has produced several other films, including Insidious (2010) and sequels, Rob Zombie’s The Lords of Salem (2012) and others, but took an extremely long time to release Area 51. The film was announced was back in 2009 when Paranormal Activity was released to theatres but seemed to be dithering forever in release. At one time, it was expected that Area 51 would be in competition with J.J. Abrams’ somewhat similar but substantially less interesting Super 8 (2011). The finished film here has a 2011 copyright date but Peli spent much time reshooting and then tinkering with it in post-production. The film was finally released in a handful of US theatres in 2015 and near-simultaneously went to video-on-demand and dvd where it accrued mostly ho-hum reviews. You cannot help but think that Peli’s constant tinkering may have caused him to miss his window of opportunity. The lack of interest may well be due to the fact that subsequent people mining the Found Footage genre have creatively drained the pool such that the studio believed that there was little audience for the film. With the film, Oren Peli conducts a faux first-person camera investigation into the great conspiracy theory belief that the US government has an alien spacecraft and/or is holding visitors at Area 51 or Groom Lake. This is an existing 23×25 mile area in Nevada that the US Air Force officially acknowledges is used as a test site, most famously during the development of the U2 plane and the stealth bomber. Far more importantly is the prominence that Area 51 holds in UFO and conspiracy theory mythology – the belief that it is where the US government houses a crashed UFO and/or alien passengers and is the testing ground for reverse-engineered alien technology. We have seen depictions of Area 51 before in films such as Independence Day (1996), Groom Lake (2002), the mini-series Taken (2002), Showdown at Area 51 (2007), S4 (2008), Paul (2011) and episodes of The X Files (1993-2002, 2016– ). Peli gets right into the conspiracy theory ideas. He makes a great effort at replicating the look of the site, even recreating the cctv monitoring receivers that sit up on the hills. There are interviews with locals and assorted crazies where you are not entirely sure if the subjects being filmed are real people or actors. You had hoped that Oren Peli’s eight-year absence from the director’s chair would have been the opportunity for him to come back and reinvent the Found Footage genre in ways that would be sensational. The disappointment of Area 51 is that he doesn’t. Indeed, the set-up of the film often feels like he is drawing from the cliches that those who followed him quickly laid down – a small group of friends setting out to investigate a phenomenon, their being chased by the things they stir up, the same abrupt and downbeat ending where they are snatched leaving only their cameras behind. That said, Peli quickly absorbs you in what is happening. There is fine tension in the scene where the group track the Area 51 employee and clandestinely enter his house – only for the man and his wife to return while they are there and the camera-wielding investigators to have to sneak into his bedroom to steal his pass. 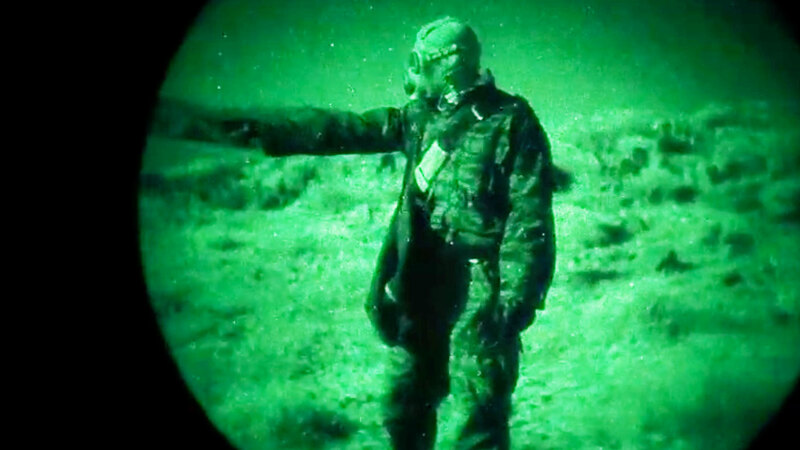 The film becomes even more fascinating when it comes to the scenes of the group sneaking into the base and in seeing the incredible arsenal of technological devices they have employed to get around motion, heat and ammonia sensors. It is during these scenes that Peli manages to create some often nerve-racking suspense. Of course, the whole thrust of the film hangs on the question of what Peli will deliver once the group get inside the base. Suffice to say, he delivers exactly what we expect and does not let down on the build-up. [PLOT SPOILERS] Usually typified as a single hangar, here Area 51 becomes a vast labyrinth of tunnels, corridors, halls and rooms – exactly what you would expect of a government base. We get some tantalising glimpses of the alien technology and artefacts. Peli takes a leaf from Ridley Scott and Alien (1979) and deliberately keeps glimpses of the E.T.’s partial and shadowy, while the scenes of people being abruptly whisked away at the end are striking and eerie. [PLOT SPOILERS] The disappointment the film reaches is a conclusion that feels like a string of loose ends. The team seemingly activate a UFO and awaken the aliens – but we are given no clues as to how or why. We never understand why people are snatched at the end. Also, the film sets up foreshadowing – that Reid Warner, just like Richard Dreyfuss in Close Encounters of the Third Kind (1977), has been left with an implanted memory following his encounter and that this drives him to be there and gives him the ability to activate the ship; or where Jelena Nik is puzzled to find items from her childhood down in the underground area where the alien cocoons are – but frustratingly leaves any payoff for these mysteries hanging. Oren Peli has also acted as producer for James Wan’s Insidious (2010) and sequels, The Bay (2012), Chernobyl Diaries (2012) and Rob Zombie’s The Lords of Salem (2012), as well as created the short-lived horror tv series The River (2012).